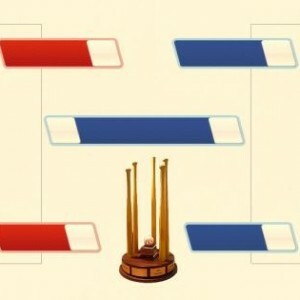 The All Stars of the Potomac Wiffleball League are once again headed back to Columbus, Ohio, in mid-July to battle for the national championship of wiffleball, the National Wiffle League Association Tournament. The team will play as the PWL Nationals. This is the third annual tournament, which is co-hosted by the PWL and largely organized by Commissioner Chris Gallaway. 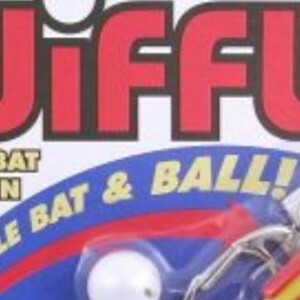 The field has expanded to 16 leagues from around the country battling for wiffleball fame in a fast pitch, base running, official yellow bat and ball tournament. A preliminary round of games will seed all 16 teams in a double elimination tournament to determine the champion. The rules committee expanded the rosters from six players to eight players for this year’s tournament. 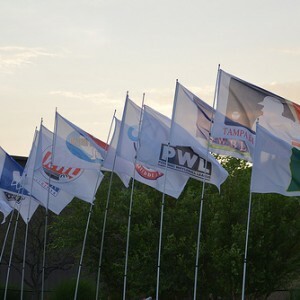 The PWL team will feature five returning players from the 2013 tournament, and three new additions. Nicholas DiCrosta is the only player not returning, though rumors of the shower incident playing a part are widely exaggerated. 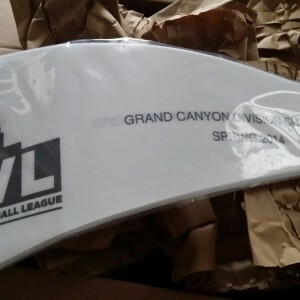 The PWL held open tryouts Weeks 2, 3 and 4 of this season to help build the newly expanded roster. Commissioner Gallaway returns as manager of the team again. “Last season we were pleasantly surprised at our improvement. This season, with the open tryouts, and adding three new pitchers, I’m confident we’ll continue to improve. Let’s be clear though, beating either WSEM or KWL is a victory even if we lose every other game.”. To help prepare for the tournament, the defending National Champions the Tampa Bay Wiffleball Lightning will be in town for a three game series just before the World Series on June 22nd. Read the full story about the TBW visit below. “We wanted to prepare in the best possible way for this tournament. Having the team that won it all last year come to DC, and scrimmage against our guys was the best way to do that i think,” Gallaway said. Flowers makes his second appearance, replacing Joe Thaman from the original squad. A solid defender the hope is his second time around he can contribute with his bat. Constantly overlooked in awards voting, mostly because everyone hates his team, and his teammates, Flowers has quietly put up stellar numbers at the plate and dominates in the field. Flowers will play one of the two outfield positions, and is the emergency, emergency, emergency mop-up pitcher. His favorite pony: My Little Pony and Friends. Gagnon returns for his third go around as the innings eater on the mound for the PWL. With the roster expansion and addition of arms he might find his role on the mound diminished, but he’s a valuable guy in the clubhouse if this team is going to be successful. In the PWL, the Moose Knuckles have played a stellar season, at one time being ranked #1 in the county. Their only loss was when Gagnon was’t there. No one in the PWL plays the game harder, and no one is less liked for it. Gagnon will be pitching and leading the team in enthusiasm. His favorite fountain: Water Fountain. Higman is the PWL All Star at this tournament, and two stellar NWLA’s have proven he’s indispensable for the Nationals. After a 2013 with a dislocated elbow, (we still wake up sometimes seeing him seize on the Blue field between 1st and 2nd base), and a temporary out of town move, he’s solidly back in top playing form and leading the Janitors to the playoffs. Higman will be covering one of the two outfield positions and getting as many at bats as possible. His favorite house: Bounce house. Jim Shannon became twitter famous with the umpire ball shot heard round the world. They even mentioned his name on ESPN, which made it hard to drop him from the team, as his numbers suggest we probably should. Shannon is a two time batting triple crown winner, and member of the five time World Champion Blandsford Barnburners. He will be an extra hitter or designated hitter, and may play some backup time in the outfield, but he really hates to play the field, especially when it’s hot. The Shannon’s are normally known for their bats, but Jack keeps his spot on this team because of his arm. As the ace of the Nationals he’s the closest thing we have to an un-hittable pitcher. If only he could hit the board more often. Obviously less famous than his twin brother, he’s generally more beneficial to both his PWL team and his NWLA team and this season is leading the league in HR and RBI. Shannon will be pitching, and serving as an extra hitter when he’s not on the mound. When you think about former collegiate pitchers in the PWL the first name that comes to mind is NOT Spencer Howard. He’s no Joe Thaman by a long shot, but he’s going to give his surgically repaired labrum a work out this season for the PWL All Stars. Howard was robbed of Rookie of the Year during the summer voting, but has put up a stellar sophomore effort. He was nominated for three player of the week awards, out of six weeks, and claimed one of them. Howard will be pitching and playing outfield. His favorite monument: The rock. Crawford has always been a good PWL pitcher, but his addition to the NWLA roster will see if he can transition to a faster paced game. In the PWL he basically carries the DC Twits, and usually is able to give up fewer runs than the Twits manage to drag across the plate. His favorite appliance: Egg cooker. Chris Fantasia is the only rookie on the squad, and will probably end up being the biggest regret of the tournament. Let’s be clear, he can throw the ball with velocity. That’s why he’s going. In the PWL he had such promise, but it’s all quickly faded away. A quick ejection as a pitcher (under 1 inning in half his games) has him longing for the NWLA’s more relaxed walk rule. When he’s not imploding on the mound, he’s doing it at the bat, and the One Hit Wonders are heading for a sub-500 season in their over-hyped rookie debut. He will be pitching and likely kept away from sharp things with which he could hurt himself. His favorite move: Footloose (the remake). Each team designates one representative each to the All Star Game and to the Home Run Derby. The All Star teams are selected by draft from among the team representatives. The managers of the All Star teams are the managers of the two teams from the most recent World Series. If they decline, the most senior manager in the league is asked. The 2014 Spring Managers are Kris Garcia of the Canvassers and Jeff Nitto of the Gumballers. Jim Shannon takes out an umpire and wins POTW for Week 6. It’s been an interesting few days in the PWL main office as we head to the final week of the Spring regular season. 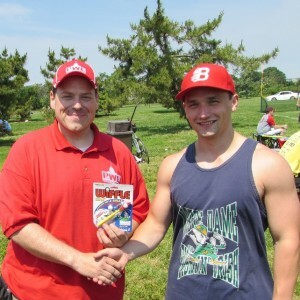 Certainly we want to be recognized for the superior brand of wiffleball being played on the banks of the Potomac River, and for the added extras that the league provides which make the us as close to a professional operation as we can. That being said, if we have to go America’s Funniest Home Videos route to get a little attention, we’re fine with that too. The “ball shot heard round the world” ended up getting us on SportsCenter, numerous other media outlets, and led to us being referred to by Keith Olbermann was the World Worst in Sports. We’ll take it! In related news, umpire Hal Ward returns to the scene of the crime this Sunday and will call the 1:30 to 3:30 games on Red. The viral video has been a fun distraction, but don’t forget there is actual work to be done as we wind down the season. If you have not already made your plans to join us for the post-season Champion’s Dinner, Home Run Derby and All Star Game, do it TODAY! Free food and entertainment on the PWL, but you have to RSVP. Don’t forget to vote for Player of the Week by Noon today! And oh yeah…we still have four teams fighting for the final three playoff spots. When the musical chairs ends Sunday we’ll see if the rookie Chuggin’ Chorizos can overtake the Canvassers or Suns Out Guns Out for a chance to keep playing. Gumballers have once again clinched at least a tiebreaker game for postseason, which put them on the path to the World Series last summer. It’s supposed to be mid-80’s and partly cloudy on Sunday, with some stronger wind than the last few weeks blowing out. Look for some increased power numbers. Jim Shannon (11 nominations, 1 win) of Barnburners has basically solidified his position in the league forever as the guy who hit the ump in the nuts and it went viral. On the day, Jim was on base every at bat but one, batting .900, hitting 3 homeruns, 4 RBIs, and an OPS of 2.800. He also pitched 5 innings of one hit ball with 8 strikeouts. And again, he hit an ump in the nuts. Brother Jack Shannon (8 nominations, 3 wins) had six hits on the day, 5 of them were homeruns. On the day, Jack batted .600, 5 homeruns, 8 RBIs, and an OPS of 2.700. Gumballers have been making a run into the playoffs, getting hot when needed, thanks in part to Nitto’s arm and Don McClintock’s hitting (2 nominations, 0 wins). On the day, McClintock batted .462 with an OPS of 1.692 — he also had 3 homeruns and 7 RBIs in two crucial wins against the Canvassers. So it turns out that the Barnburners can hit the ball! Our THIRD Barnburner nominated for the day goes to Colin Gannon (2 nominations, 0 wins). Colin, like the rest of the Barnburners took advantage of mediocre pitching and ran with it, batting .500 on the day, hitting 3 homeruns, and getting himself 6 RBIs with an OPS of 2.125. He also pitched 3 innings with 3 strikeouts and no hits. The clip from Week 6’s game of Barnburner Jim Shannon “disabling” umpire Hal Ward has gone viral. The story was covered on ESPN SportsCenter, MLBTV’s Intentional Talk and many other outlets. 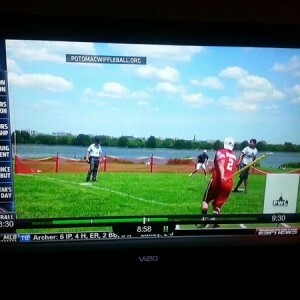 Keith Olbermann designated us the World’s Worst in Sports for Monday, June 2nd. Five of the eight teams heading to postseason have clinched their spots, but much if left to be determined. The overall playoff schedule, though tentative, has been set. There are MANY events throughout the postseason for which all players and teams will participate, not just the playoff teams. So mark your calendars now. The opening round of the playoffs will feature eight teams, the six division champions and two wild cards. The #1 seed will play the #8 seed (unless same division) in these four matchups. The higher seed in each best of three game series gets to pick their home field for Games #1 and #3. And the overall top two seeds get to pick if they play early or late for this round. If the two higher seeded teams pick the same home field in a time slot, one of the series will shift down one hour for start time. The Division Championship Series will feature the four winners from the first round. We’ll re-seed to make sure the best seed plays the worst seed, this time, regardless of division. It will again be a best of three series. These series will be SATURDAY, June 21st. That’s right, wiffle on a SATURDAY. One final Sunday for the Spring Season will wrap everything up in addition to featuring some guest out of town competition from the Tampa Bay Wiffleball Lightning team for the NWLA tournament. Before the World Series the PWL All Stars headed to Ohio will scrimmage with the TBW team in a best of three game series. The series will kickoff at 9:30 AM. The World Series will be a best of three games series featuring the winners of the two Division Championship Series. The post-season awards presentation, as well as the home run derby and all star game will follow the World Series. Food and drinks for the dinner will be provided by the league. 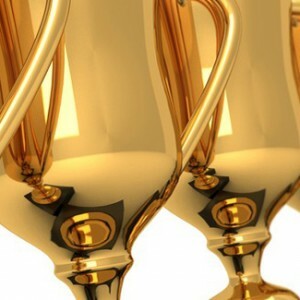 Awards which will be voted on following Week 7 will be handed out. Each team in the league gets one member each in the Home Run Derby and the All Star Game. If a Game 3 is necessary, subsequent events will be push back until the completion. All events are open to all fans and league members. If you are attending the dinner, you must RSVP via our facebook site so that we can have an accurate count for food. It’s good food, and please join us, but give us an accurate count. 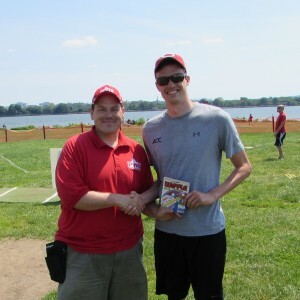 Rookie Andrew Dilz of Chuggin Chorizo wins Player of the Week for Week 5. After what feels like an eternity of almost 14 whole days, wiffleball returns this Sunday with two final weeks of regular season. It’s going to be spectacular, high 70’s and low single digit wind. It will be so nice you’ll probably forget about the four tents that broke the first three weeks due to the wind. Two playoff tickets have been punched as the Moose Knuckles and the Barnburners clinched their divisions. The other six spots though are still up for grabs. This penultimate weekend is a time for those in the hunt to prove they deserve to be there. Rookie Andrew Dilz (first nomination) has found himself in a playoff race all of a sudden with Chuggin Chorizos after two big wins, thanks to his pitching and hitting. Dilz batted .533 on the day with an OPS of 1.333 (top of the league for the week), including 4 doubles and a walk off RBI against the Twits. He also pitched 18 innings on the day, giving up 1 run and striking out 18. Not bad! Our first of many pitchers again this week, Matt Dreyfus (9 nominations, 1 win) doesn’t usually pitch, but maybe he should. In one game against SacBunt, Dreyfus threw a perfect game, striking out 4. He hit .300 on the day, with an RBI. Chris Keevan (6 nomination, 0 wins) has had to fill the big shoes left by Joe Thaman this year, and has been doing well so far, only giving up 3 runs so far all year. This week, Keevan pitched a perfect game against Dupont Circle Jerks. On the day, Keevan had a 0.00 ERA, gave up 3 hits in 11.5 IP, 0 runs, and 9 strikeouts. He also batted .308 with a homerun and 2 RBIs. Jeffrey Nitto (5 nominations, 2 wins) missed a few games early on in the season, but has come back nicely for the Gumballers. This week, Nitto perfecto’d DC Twits. In 12 IP, Nitto gave up 1 hit, 0 runs, and struck-out 8. He didn’t have the best day at the plate, only going 1 for 11 (.091). If you missed it, there was a lot of “trash talk” going on with Suns Out and Moose this past week, so make sure to circle your calendars for June 8th at 3:30p when they play each other. This week though, Chris Mazur took to the mound and threw a no hitter against Besley Bashers ( there was 1 error ). On the day, Mazur pitched 10 innings, allowed 1 unearned run, had 8 strikeouts, and batted .333.